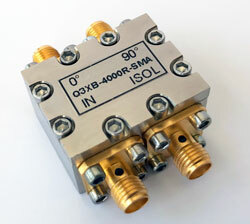 Electro-Photonics is a global supplier of RF and Microwave components. Since 2009, the company has been designing and selling quality standard and custom products to satisfied customers in the US and around the world, including Fortune 500 companies. Provide tight coupling, low insertion loss, and good phase tracking while being able to withstand high power. Custom design couplers from 30 MHz to 18.0 GHz and power levels up to 500 W.
Have low insertion loss, high power capability, high directivity, flat coupling in a small package. Custom designed SMT RF & Microwave power dividers/combiners covering the frequency range from 0.4 GHz to 18 GHz. RF & Microwave test fixture for exceptionally accurate and repeatable measurements. Company create RF & Microwave test fixtures solutions for even the most technically challenging applications.